POS Charges and Fees Explained: Should You Pay? When you see the term POS on your bank statements your online transaction history, it usually refers to a purchase you made with your debit card. That label might refer to the amount you paid a merchant, or it might signal that you were charged additional fees for using your card. If you’re trying to figure out what a transaction in your account history means, it probably refers to a purchase you made in-person at a retailer. Point of sale systems: A point-of-sale (POS) system is a combination of devices and software programs for keeping track of transactions and completing sales. They can be as simple as a checkout register, or they may be more complicated programs that integrate with other systems. Retailers and online merchants use POS systems to accept payments and manage their businesses. Debit card purchases: Charges that show up with “POS” are typically a result of using your debit card. 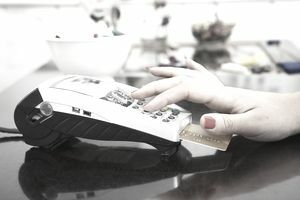 Most likely, you chose “Debit” at checkout and entered your PIN on the retailer’s payment machine—as opposed to choosing “Credit” and signing for the purchase). Online purchases and in-person transactions can both result in POS appearing on your statement. Unauthorized charges? If you see charges that you don’t recognize, research the transaction as soon as possible. POS charges mean that somebody bought something using your card, and they are typically not automatic recurring bills. Identifying charges: The name of the vendor or merchant should appear alongside any charges. However, sometimes the name isn’t helpful—the business might use a different name than the one you think of, and abbreviations add to the problem. If you see something you don’t recognize, do a web search for the exact name you see in your transaction history. In many cases, you’ll find a more helpful description because others have wondered the same thing. If you’re still stumped, look back through your calendar and think back to all of the spending you’ve done to verify if you’re actually responsible for the charge. Fraud in your account: If somebody used your card without your permission, you generally have the right to get those charges reversed. But you have to act fast. Federal law says that you’re not responsible for certain types of fraud and errors in your bank account. Contact your bank within two days of discovering any suspicious charges—if you wait too long (more than 60 days), you may be fully responsible for paying the bill. Credit cards are safer: For everyday spending and online shopping, a credit card is safer than a debit card. Debit cards have direct access to your checking account, so fraud and mistakes can instantly drain the account. When that happens, you run out of spending money, bounce payments, and face penalty fees. Credit cards, on the other hand, have a grace period, which allows you to pay for charges up to one month later (or more, if you want to pay interest—which you shouldn’t do). Getting mistakes cleared up just means you’ll temporarily have a higher credit card bill, but your checking account will be untouched. A POS charge can also be an additional fee that your bank charges when you use your debit card. If you choose “Debit” at checkout and use your PIN, banks sometimes charge an extra fee. That charge is usually around one dollar or less. Use a different bank. It’s increasingly rare for banks to charge these types of fees, so there’s a good chance you can find another bank that costs less. You can even keep your existing account and open an online checking account (with a debit card) that allows you to use plastic for free. Small, local credit unions are also a good bet. Choose “Credit” instead. Banks earn less income when you choose “Debit” at checkout, so some try to make up for it by adding a fee. The fee may be minor, but it gives you a nudge to choose “Credit” next time. However, retailers may end up paying extra when you do that, making it harder for your favorite stores to stay in business and offer low prices. Unless you use cash or checks, somebody always pays a fee for processing payments. Banks and card processing networks charge swipe fees to retailers when you pay with plastic. The fees are lowest when you choose “Debit,” which retailers appreciate. If you choose “Credit” instead, retailers pay higher fees (so that you don’t have to), but you should expect those retailers to pass the costs on to you in the form of higher prices. Merchants even pay fees when you pay entirely electronically. For more details on the debit vs. credit decision, see How Interchange Fees Work. Some retailers don’t build those fees into their pricing. Instead, they prefer to charge more only to customers who create the extra costs: Those customers who pay through the more expensive credit card networks. For example, a merchant might charge a credit card surcharge to customers who pay with credit, or they might impose a minimum purchase requirement for credit card payments. Is that legal? Surcharges and minimum purchase requirements are allowed in some states. But merchants sometimes charge consumers more than they're allowed to, and they may impose minimums when they're not supposed to. Even when merchants aren’t breaking the law, they might break the rules set by their payment processor. To learn more about your rights when paying with plastic, read about credit card surcharges (and minimums) and debit card minimums.